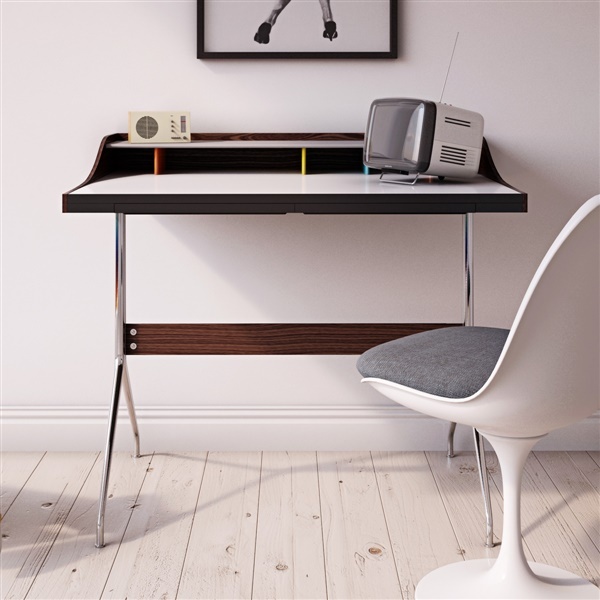 Reproduced by Inmod to maintain its quality and design, the Swag Leg Desk is a highly accurate replica of a mid-century icon. Vibrant dividers combined with solid walnut wood construction, a white melamine desk top and polished stainless steel legs create this chic and classic mid-century desk. Origins by Inmod successfully reproduces a classic, mid-century modern design to the standards of today's chic styles in the Swag Leg Desk. The ultra modern desk features a fresh, minimalist design that includes sleek yet sturdy stainless steel legs and a spacious desk top crafted from a combination of durable melamine and strong yet beautiful solid wood. Open compartments for storing supplies are divided by brightly colored dividers that pop against the white melamine surface while a polished finish in the legs adds subtle radiance. The compact design of the Swag Leg Desk makes it perfect for smaller spaces, but no matter where you place it, this unique desk adds function and style to any room it graces. Nice to find a desk with a metal and wood combination - super modern and fits like a glove in my home office - thanks! I ordered this reproduction without being concerned with quality. Based on the reviews on the site, I felt confident that just good enough would suffice my needs. It is a desk for a college student. Once I received the desk and put it together. OMG! I was blown away by the phenomenal construction, the heft of the stainless steel legs, the quality and workmanship of the wood and laminate. I actually think this repro is equal or better than the original. This desk is 1/4 the cost of a new "original" and 1/8 to 1/10 the cost of a vintage original. However, this desk is 100% worth every penny if you are looking for the swag leg desk look and want a piece of furniture that is extremely well made and can be considered an heirloom piece. I told my son to treat this desk right and it would be a lovely gift for one of his children to use when they are in school. Can't find enough positive adjectives to say how great this desk truly is. Consslight ding on one of the wood corners (noticeable only if you are looking closely), probably happened in shipping. inMod already credited me $75 for the delay in shipping/carrier notice (I had to track the desk down) so I was not about to complain. Didn't want to just buy any old desk, I wanted something with a modern edge and this desk hit the mark, customer service recommended it and they did a great job! Quality construction, great value for the price. Needs about 20 mins assembly time but one person can easily handle it. The storage compartments on desktop are useful to neatly store stationary and gadgets. Nice to place monitor on top "level" for good ergonomics and clear room for keyboard, books, notes, etc. This was an easy choice for our office - we are a small startup company who just moved into a new space and wanted the atmosphere to have a more unique and modern look than before - these hit the mark perfectly for what we were hoping to achieve - tons of great items on this site! Thanks a lot! I LOVE the walnut wood with white top combination and the colorful dividers - it GAVE A LOT OF OPTIONS in choosing the type of desk chair, decor and other furniture I could use in my office! It's great! The Nelson Swag Leg desk caught my eye, but I didn't have $2500. I saw a couple nice looking reproductions on various sites. I had never heard of Inmod, but the reviews looked good and the reviews of this particular reproduction were positive. The price was the best I could find so I took a chance. It shipped fast and the truck delivery (Pilot) was professional. Everything arrive in good shape. There were a few tiny flaws on the white melamine if you looked closely, but it was 99% perfect, which is much better than I've come to expect from "shipped in a box" furniture. The desk itself is substantial and beautiful. The walnut feels solid. The stainless legs are heavy and of good quality. The included screws were high quality and everything lined up. Assembly was simple. The only issue I encountered was the included stainless grommet was about 2.4 inches in diameter. The hole in the desk is about 2". I measured both on my digital caliper. I figured they much have included the wrong grommet in the box. Typical grommet sizes seem to be either 2" or about 2.4". Anyway, I just ordered the correct size grommet from elsewhere for about $7. Drawers are surprisingly functional for being so low profile. One other consideration--the brace going across the middle could partially block a desk chair from sliding all the way in depending on the size and shape of your chair. I rate this about 4.8 out of 5. Love the simplicity of the design with a few splashes of color in the mix, the cubbies are great for organization, the dimensions were exactly perfect for the size of the space i wanted the desk in, I'm 100% satisfied with my order! What country of origin is the desk produced. 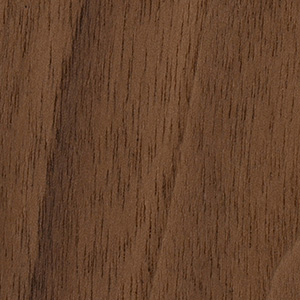 The Swag Leg Desk is manufactured in China, using North American-sourced wood. What is the height of the writing surface? The height of the writing surface is 29.5".